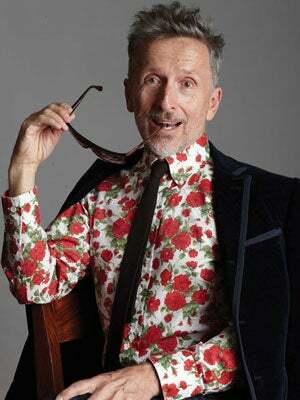 Barneys' creative ambassador at-large (and all-around personal style wizard) Simon Doonan stops by the W Hotel tomorrow for a book party for his new tome, Gay Men Don't Get Fat. With an RSVP, you can swing by the free event, grab a book and an autograph, and swill specialty cocktails while gleaning pearls of wardrobe wisdom from the author. But it's an event (and likely, a packed one), so you won't have tons of time to ask Simon all your burning style Qs — which is why we did just that, for you. We got the dapper Brit to dish his thoughts on spring trends we have to try, dressing for a conservative workplace, and the celeb styles he's currently loving. Read on for some first-class advice from one of the most fabulous men in fashion. What trends should women most look forward to for spring? "You need to indulge in some digital prints by Erdem or any designer who is doing prints. They are gorgeous and life-enhancing." What are your favorite colors for the season? "[I] am having a blue period: cobalt, electric, sky blue, baby blue..."
For winter, is there any tip or trick we can use to look less frumpy but still be warm? "Huge glamour shades by The Row can make for a less frowzy look when you are bundled up." What's your least favorite current fashion phenomenon? "I think the jumbo mega-platform may have peaked. [I] am loving the platform-less shoe." Any starlet style you're really digging right now? "Rooney Mara really has an edgy, groovy quality. She reminds me of the punk rock chicks I knew back in the '70s. God! I'm old!" What can Washington women do to step up their work wardobes? How can you have fun with your style when the work culture is so conservative? "I think it's better to accept and surrender to the conservative nature of your Washington work environment — and then let loose at the weekends with something more outrageous." And what about the men — what would you like to see Washington men wearing these days? "Men in Washington are all playing it safe, and rightly so. When politicians start dressing like rock stars and freaks, then you should start to worry." We've heard your thoughts on political style — if you could have a day to do some personal shopping for any one candidate, who would it be, and what would you do? "Dressing any politician would be a thankless task. They need to look boring in order to get elected. Dressing them would be no fun at all." What's your most prized fashion possession? "I love my Goyard bag with my initials emblazoned on the side. SD — sometimes people on the subway ask me if I am from South Dakota." Any secret talents we should know about? If you weren't a fashion guru, what would you do in a dream career? "I would love to be a pro soccer player. Just call me Sporty Spice." When: Wednesday, February 1, from 7 p.m. to 9 p.m.
Where: W Washington D.C., Altitude Rooftop Ballroom, 515 15th Street NW; RSVP via email. Best D.C. Salons • Celebrity Style • Fashion • Fashion Week • New York • News • Street Style • Style • Trend Tracker • Washington, D.C.